Many people assume that viewing the magnificent red deer in Killarney National Park means a trek into the wilds armed with high tech cameras and a survival kit. Heading off the beaten track is often the best way to observe the red deer in their natural habitat. However, it is also possible to view the deer safely at places just 10-15 minutes walk from Killarney town. There are even some areas where you can view the deer without leaving your car. There are two main areas where it is relatively easy to get a good view of the red deer in Killarney. 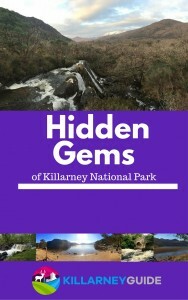 The first of these is in the Knockreer area of Killarney National Park. The main entrance to Knockreer is directly across from St. Mary’s Cathedral, about a ten minute walk from Killarney town centre. A cycle path and footpath along Mission road will take you directly there. Roadside parking is available on Port Road directly outside the entrance but this can be quite busy during the summer months or when services are underway in the nearby St. Mary’s Cathedral. You can find out more about the Deenagh Lodge in the post about the Circular Walk. At the Deengah Lodge, you can continue straight on or turn right at this point. Turning right will lead you up a slightly hilly section so if you’re feeling less energetic, continue straight on along the path. Continue down the hill and turn right over a cattle grid. This circular route continues and you can follow it all the way back to the Deenagh Lodge if you wish. If you have started by going right (up the hill) at the lodge, you will be on this circular route in the opposite direction. On the map below are four areas where you are most likely to see the red deer in Killarney within this area of the Park. It is almost guaranteed that you will see them here but keep your eyes and ears open. They are very well camouflaged and you may well miss them even when they are quite close to you near the path. If you are visiting the park during the deer rutting season (late September / early October), please be vigilant as the stags are quite active and you should give them a wide berth should you have a close encounter. The second area where it’s pretty easy to see the red deer in Killarney is at Muckross. Here you can even view some of the red deer without having to leave your car if you are driving. If taking in some fresh air is not on the agenda, there are a couple of areas where you have a great chance of seeing the deer from within the comforts of your own car. At worst, you may have to park and walk a few metres to get a closer look. Head out of the town towards Muckross House & Traditional Farms. Just a few short kilometres later, you should be able to get a good view of the deer at the areas marked on the map below. One of the best and most popular ones is directly opposite the main entrance to Muckross House. These are just a few areas where you have a great chance of spotting the red deer in Killarney without too much effort. Hopefully a close encounter here will encourage you to venture further into Killarney National Park. Je garde un excellent souvenir des balades faites sur les sentiers du parc en Juillet 2016. Les fabuleuses rencontres faites avec les Red Deers qui ne sont vraiment pas farouches, et se laissent photographier sans problème. Je recommande ce parc, pour les personnes de passage ou séjournant plusieurs jours à Killarney . Je suis heureux d’apprendre que vous avez aimé voir le cerf rouge lors de votre visite à Killarney. Ils sont un spectacle merveilleux à voir dans leur environnement naturel. Have carvaned many yrs with family. Now wife & I make use of your great hotels & continue to visit 2-3 times per year. Coming down late Oct would love to see more red deer. Good to hear Michael and thanks for visiting the site and taking the time to leave a comment. There’s only a week or so left in the rut so you should catch the end of it in late October. It’s in full swing at the moment! thanks for the info on red deer. keep up the good work!